Built 1908 to lot number 171. Even today, nobody absolutely knows the real reasons for building The Great Bear. It has been said that it was built purely for prestige purposes as this was the first Pacific 4-6-2 created in Britain, while others say that G. J. Churchward himself wanted to prove that his designs were sound for large locomotive boilers. Built in February 1908, it was restricted to the Paddington to Bristol line due to its high axle loading giving it a route availability of 'Special Red' as indicated by a black 'plus' sign on a red disc . As with all new designs, there were problems, mostly regarding clearance on curves and springing of the trailing wheels. Modifications were made to the superheating of the boiler, but with the 1914-8 war and advances in 4-6-0 locomotive designs, insufficient development work was given to The Great Bear. 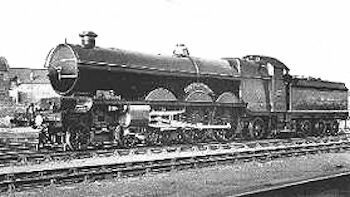 Eventually, on the 7th of January 1924, when the locomotive needed heavy repairs to its boiler, it was decided to dismantle The Great Bear after just 527,272 miles and use parts of the engine rebuilt into a Castle class locomotive with the same number of 111 but named Viscount Churchill. It was said that Churchward was upset at the destruction of his engine, but when he heard that Gresley was to build a 'Pacific' for the Great Northern Railway, he remarked "What did that young man want to build it for? We could have sold him ours!"